Aizu Central Hospital Cup: Xie Yimin (right), Women’s Meijin, will meet O Keii 2P (left), the daughter of O Rissei 9P, in the final of the 2nd Aizu Central Hospital Cup. In the semifinals, played on June 7, Xie beat the previous winner Fujisawa Rina 2P by resignation and O (B) beat Kato Keiko 6P by 4.5 points. 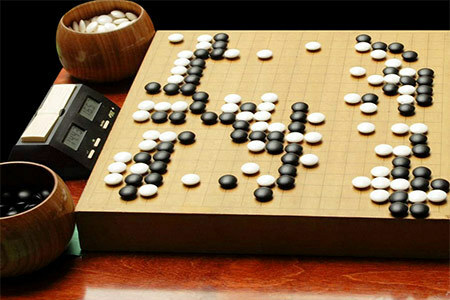 The final, the only two-day game in women’s go, will be held on July 2 and 3. 2nd Mlily Cup: Nineteen Japanese players took part in the open preliminary tournament for the 2nd Mlily Cup, held at the Chinese Qiyuan (Ki-in) in Beijing from May 22 to 26. They were made up of ten male professionals, five female professionals, and four amateurs. No Japanese players won a seat in the main tournament, but Yo Seiki 7P, Fujisawa Rina 2P and Xie Yimin 6P did reach the semifinals. In the second round, Fujisawa scored a memorable win over the world’s top-rated woman player, Choe Cheong 5P of Korea. Fujisawa, playing white, had fallen behind but found a brilliancy, a move that looked like a suicide move but which turned the game around. Fujisawa commented that Choe, who is two years her senior, is definitely stronger than her, but she was happy to pick up a win. O Meien wins 1,000 games: A win on June 4 was O Meien’s 1,000th as a pro. He is the 16th player at the Nihon Ki-in to reach this landmark, and it took him 38 years two months. With 571 losses, two jigos and two no-results, his winning percentage is 63.7. Correction: In my report about Otake Hideo’s decoration (5/3 EJ), I wrote that he was the 23rd go player to be so honoured. Go Weekly subsequently amended the list it published; actually 25 players have won decorations.